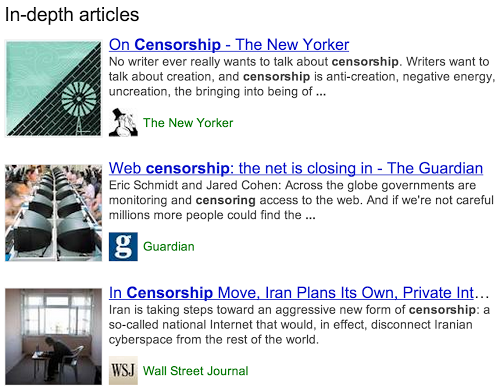 Google announced new feature 'In Depth articles' for Google Search | NewbieTechTips! This new feature is intended to surface authoritative and detailed write-ups and articles on certain different subjects like pollutions, censorship or celebrity profiles. As per the information available till now there will be three “in-depth” articles which will appear in the main result page from sources like The New Yorker, Guardian, Wall Street Journal etc. reflecting what Google thinks are the most important articles on that given subject. Google also mentioned that these 'In depth' search results will remain stable for weeks or months because these result meant the best available information on the topics. Google also says that it has no plans for selling the slots for in depth articles as for now. So what this means for the publishers? For big publishers it’s a good news as the stories will be highlighted more in the search which directly means sudden spurt in visitors from the search, but it may not be a good news for small publishers who will find it difficult to include their articles in this 'In Depth Articles' list, but don't get discouraged as one of the Google spokesperson says that, lesser known blogs or small-town newspapers will make the three-article cut if they are especially definitive or informative. So just start writing impressive and extensive articles on important topics following the Google guidelines to see your article in this top 3. Following these best practices along with our webmaster guidelines helps our systems to better understand your website’s content, and improves the chances of it appearing in this new set of search results. " This feature will be rolled out on google.com search in English language in the phase-wise manner. So you may not see this feature just now. But eventually it will appear for all English language searches.